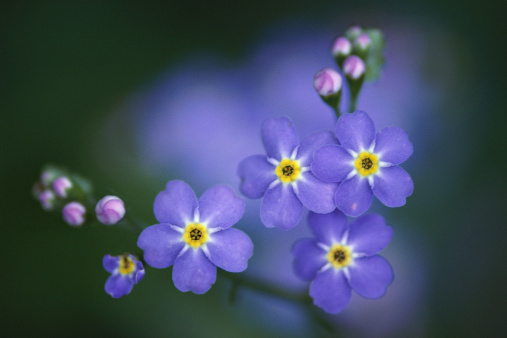 Forget-me-nots, or Myosotis sylatica, are wildflowers that range from North America to Europe and New Zealand. They prefer to grow in partly shaded, moist woodland areas and sport small blue flowers. Up to 50 species exist and they all tend to reseed themselves readily, providing a continuous array of delicate flowers, mostly in spring. They are hardy in most United States climate zones, tolerating winter low temperatures down to minus 40 degrees Fahrenheit. Light pruning and deadheading will promote more flowers over a longer growing season. Forget-me-nots have little blue flowers. Snip off spent blossoms to encourage the plant to produce more blooms. Cut flower stems back to the branch from which they grow, taking care not to cut into the branch. Cut entire branches, including flowers, to use as cut flowers indoors. Prune each bush to shape it and keep it tidy. Forming a forget-me-not plant into a globe or ball shape makes it attractive and helps it to produce more flowering tips. Cut your forget-me-not back to the ground in late fall or early winter. This plant sometimes behaves as a perennial and will send up new growth from the root system the following spring.